I can proudly say that neither of my kids have had a sunburn. Of course, just typing that guarantees that their virgin skin will be red soon. The moment you declare one thing on a blog, the opposite becomes true. That’s a fact. While I’m on it when it comes to protecting my kids’ skin, sometimes my own becomes an afterthought. Before we even leave the house to go to the pool, the kids are slathered up from head to toe with sunscreen. I think getting two little people ready for the pool is a huge feat, so it’s no wonder I’m haphazardly wiping a few smears of sunscreen on myself while trying to get the kids to wait for me before jumping in the water. Before you start to lecture me about sun protection, please know that I’ve gotten much, much better. There were a few teenaged and 20-something years that through the quest for a tan I ended up with my fair share of sunburns. I thought SPF 8 was perfectly adequate for 5 hours of beach volleyball. Yeah, we live and we learn. Now days, it’s only once in a blue moon that I get too much sun and my skin actually gets a sunburn. But when it happens, I want relief. Shortly after I started using essential oils, I googled “sunburn relief essential oils” like a madwoman and searched for a way to naturally treat an untimely sunburn. I was red and had to wear a dress the next day. I whipped up a DIY after-sun spray and sprayed it on the sunburn every 10-15 minutes. Not only did it help with the pain, it also took the redness away! I was so happy I didn’t have to look like a lobster in my dress the next day. This was a few years ago now and the last thing on my mind was writing a blog post about it, so I don’t have pictures. You’ll have to take my word for it. Since then, I’ve used this same DIY after-sun spray when I’ve needed some natural sunburn relief. I didn’t think about sharing it with you until recently when a friend was burned and I passed the recipe on to her. 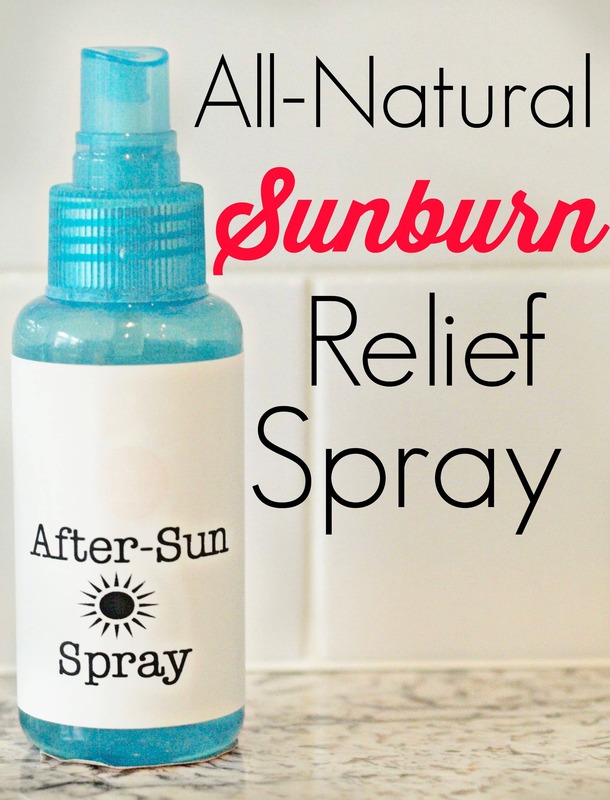 This is an all-natural and effective sunburn relief spray. It takes away the pain and if used consistently, will also help take the redness away. When I was really red, I had to spray it on every 10 minutes for a few hours, but the redness did go away. This helped turn my husband into a believer of essential oils! He couldn’t deny that this natural sunburn relief spray worked better than anything he’d seen. While I hope you protect your skin and don’t get a sunburn this summer, if you do, here’s the recipe to get relief! Even if you don’t have a sunburn, this is a great cooling spray for after you’ve been in the sun all day. Fill your spray bottle almost all of the way with water. Add the essential oils. Spray over affected areas and allow to dry. Repeat every 10-15 minutes or as necessary. I’m ashamed to say that I still haven’t used essential oils. This sounds so much better than all the chemical-laden products out there! I can’t wait to try. You need to get on the essential oils train! I use them all. the. time. I have used peppermint oil for sunburns, and it is very soothing! I love this spray idea! Can you use plastic bottles since no citrus oils are used?